France made them famous - the neighborhood place with better food than you'd get at home, but not unlike the food you'd get at home. The place where the street cleaners, truck drivers, starving artists, and carpenters sidle up to a bar, rub elbows, and restore their souls as the sun goes down on another long, dirty day. It's always just down the block, maybe two from a market that keeps the food rich and fresh. As we come together in Lowertown to celebrate art, food, sports, and commerce, Saint Dinette invokes the welcome and comfort of a "maison," or house - a gathering place for this re-born River City. You're invited to settle into Saint Dinette's idea of North American hospitality and discover a three-nation, waterborne joie de vivre. As your hosts, Saint Dinette is set to guide you through flavors found from the mouth of the St. Lawrence River, through the Great Lakes, down the Mississippi, and to the jungle coast south of the border. Spain has tavernas, Italy trattorias, and Germany its rathskellers… St. Paul has Saint Dinette. In a town known for delicious burgers, these are the most famous. Add some Capital City love to your feed by snapping a photo at the 25 most Instagram-worthy locations in Saint Paul. 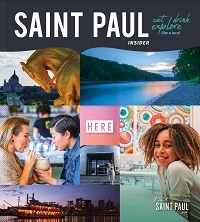 Planning a weekend in Saint Paul? Travel bloggers Jenna and Micah Kvidt of Wander the Map can help with that. The Lowertown food scene...so hot right now. Saint Paul only looks great four seasons out of the year. Thankfully, fall is one of them.